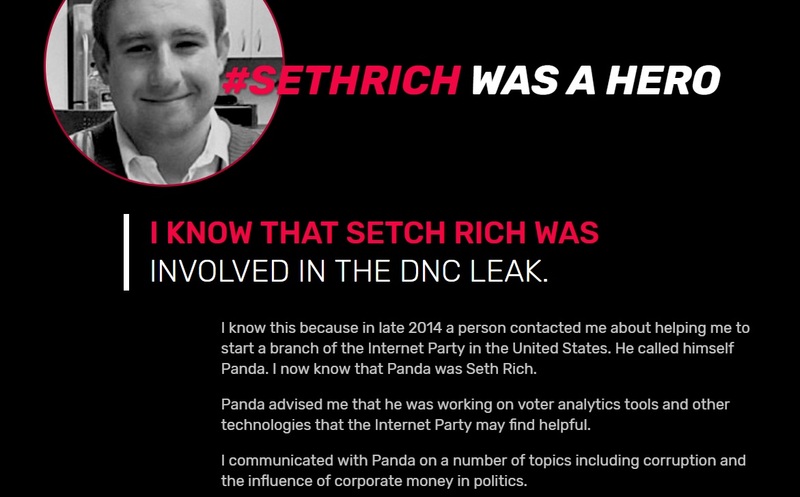 Kim Dot.Com dropped a bomb last week when he claimed to have evidence that former DNC worker Seth Rich was involved in the leaked emails released by WikiLeaks. He admitted earlier this month that he was part of an operation along with Seth Rich to get stolen DNC emails to Wikileaks. Last week Kim DotCom shared that he was willing to come to the US and give testimony if it is required. 1. We act for Kim Dotcom in New Zealand. 2. We are writing to you in your capacity as special counsel appointed to carry out the above investigation pursuant to Order 3915-2017 (Investigation). 3. Mr Dotcom has evidence that he considers relevant to the Investigation. The purpose of this letter is to confirm that, subject to appropriate arrangements being made and his constitutional rights being preserved, Mr Dotcom is willing to provide this evidence to the Investigation. He has instructed us to make this approach to initiate the necessary dialogue as to the required arrangements. 4. As you may be aware, Mr Dotcom resides in New Zealand. Since 2012, the United States has been seeking his extradition to face a criminal prosecution arising from his involvement in the Megaupload group of companies. Presently, Mr Dotcom is on bail while he exercises (as he is entitled to) his rights under New Zealand law to resist extradition. Mr Dotcom emphatically denies the alleged offending and is committed to defending the allegations in the extradition proceeding in New Zealand. 5. Mr Dotcom is also committed to achieving an outcome where his evidence can be properly received and reviewed by you as part of the Investigation. You will, however, appreciate that, given his current status, he is not in a position to voluntarily leave New Zealand’s jurisdiction. Further, he is concerned that, should he travel to the United States voluntarily, he would be arrested and detained in custody on the current counts on which he has been indicted. 6. Accordingly, for Mr Dotcom to attend in person in the United States to make a statement, and/or give oral evidence at any subsequent hearing, special arrangements would need to be discussed and agreed between all relevant parties. Such arrangements would need to include arrangements for his safe passage from New Zealand and return. This is because Mr Dotcom is determined to clear his name in New Zealand. 7. Mr Dotcom invites the Department of Justice to contact him through counsel to progress the taking of his evidence once you have had an opportunity to consider this letter and are in a position to discuss the required process and appropriate safeguards. 8. We look forward to hearing from you. If you have any questions, or require any further information, please do not hesitate to contact us.